According to the Canadian Dental Association, 7 out of 10 Canadians will develop gum disease at some time in their lives. Up until recently, there was no long-term, minimally invasive, non-surgical gum disease treatment. For decades, the cleaning of root surfaces (called scaling and root planing) has been done in combination with antibiotics. This approach is often uncomfortable and temporary, typically repeated every 3 months. Surgery is reserved for advanced gum disease. The surgical procedures can be painful and require on-going maintenance therapy scheduled as frequently as every 6 weeks. We are pleased to announce that we are introducing a revolutionary form of treatment of gum disease. The prescription Perio Tray is customized for individual patients with an internal seal that helps place medication deep below the gums so that the medication can fight the infectious bacteria. This is important because brushing, rinsing, and flossing just can’t reach below the gums to manage the bacteria that cause the disease. You can’t cure gum disease but you need to manage it well or the bacteria will recolonize and continue the disease cycle. The Perio Tray was created to get medication deep beneath the gums and hold it there long enough to fight the bacterial communities (called biofilms). 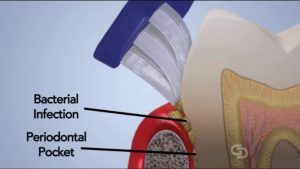 The Perio Tray is a unique prescription medical device that is used under the supervision of a dental professional for more effective and long-term gum disease treatment. Perio Protect uses a 1.7% hydrogen peroxide gel (Perio Gel) – an anti-microbial we produce naturally in breast milk and in urine. When the Perio Tray is used to deliver hydrogen peroxide deep below the gums, research shows it helps reduce biofilm, bleeding, and pocket depths. 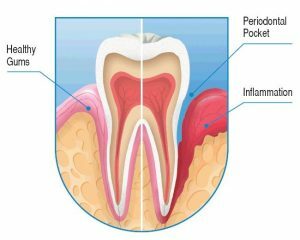 The peroxide releases oxygen, killing some oral bacteria but also causing a change in the micro environment of the periodontal pocket so that it is harder for the infectious bacteria to repopulate. When used daily, patients can better manage gum disease. 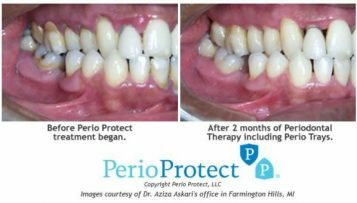 Ask us about Perio Protect and its benefits!